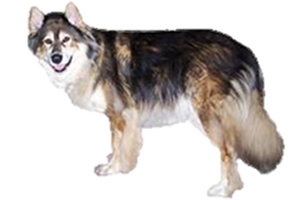 The Mackenzie River Husky is not so much a breed of dog, but rather a type. This term describes several populations of sled dogs throughout the arctic. The name "Mackenzie River" was given to these huskies by outsiders, in an attempt to name these crossbreeds that had a mixture of blood from native sled dogs, St. Bernards, Newfoundlands, Staghounds, other breeds, and possibly wolf. Regardless of the fact that these dogs are in truth a mix breed they are thought to be the classic sled dog of the arctic and recent interest has risen to preserve them. The majority of the remaining breeding stock remains in the care of Alaskan Donna Dowling. Is the Mackenzie River Husky Right for You?